18 China, Gen Yue Land Co., certificate for 500 shares, 1944, ornate border with underprint of building, text in Chinese, seal in English, black & green, VF. (1). 50 Great Britain, Carbrook Steel Works Ltd., Sheffield, certificate for ordinary shares, 1899, ornate heading, scrollwork at left, black, red seal, VF. (1). 1138 Great Britain, Exeter and Crediton Railway Co., certificate No.2040 for one share, 1845, ornate heading, black, blue seal, scarce, VF. (1). 1176 Russia, 12 railway bonds, Black-Sea-Kuban Railway 1911 Loan, 9 x bonds for £100, Troitzk Railway 1910 Loan, bonds for £20 and £100, Chemin de Fer de Boukhara, provisional certificate for one bond, 1914, all with coupons, some damage, mostly F-AVF. (12). 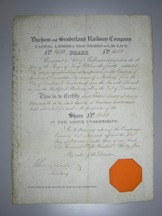 1160 Ireland, Newry, Warrenpoint & Rostrevor Railway Co., certificate No.231 for one share, 1846, printed on vellum, black, red seal depicting locomotive, VF. (1). 1150 Great Britain, Wharfdale Railway Co., certificate No.20133 for one share, 1846, vignette of the famous ?Craven Heifer?, an extremely large cow which made vast profits for its owner being exhibited around the country, black on pale blue, large red seal, AVF. (1). 34 Great Britain, Great Western Railway Co., certificate No.46902 for one quarter share of £25, dated 1845, ornate heading, black with red seal, VF. (1). 36 Great Britain, Leeds & Thirsk Railway Co., certificate No.42907 for one new extension share, 1848, printed on linen, ornate design, black with red seal, VF. (1). 38 Great Britain, Manx Northern Railway Co. Ltd., certificate No.53 for 5% preference shares, 1880, large coat of arms at top, black with embossed seal, VF. (1). Became part of the Isle of Man Railway under the 1904 Isle of Man Railway Act.